Due to a high volume of interns for the Fall term of 2018, and the Spring term on 2019, the prayer cabins will be unavailable for rent until the Summer of 2019. One of the most notable features of Evergreen's property is the remote location and quiet surroundings, which makes it ideal for those who are searching for a quiet place to rest, pray, seek the Lord, and remove themselves from the hustle and bustle of daily life. 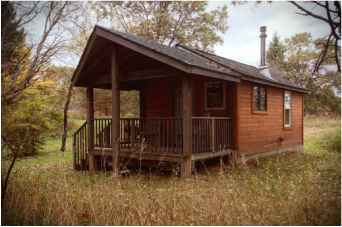 Each cabin is heated, and a bathroom, kitchenette, refrigerator, and microwave. Guests may partake of the main meal at the Center (lunch), and basic breakfast items will be provided at no cost. In addition, guests are invited to participate in the Morning Times (9 to﻿ 10:15am, Monday - Friday) with interns and staff, as well as the Tuesday night Prayer Service, Wednesday night Bible Study, and Sunday Service.